Before and during the sugaring season, people always ask what we think the season will be like. One thing sugarmakers can count on is that the current season will be different than last year's, no two ever being exactly the same. There is no way to know what the weather will do and how the sap will run. This year we tapped the trees the weekend of February 18 & 19, which turned out to be perfect timing as the temperatures warmed up and the sap began to run immediately. 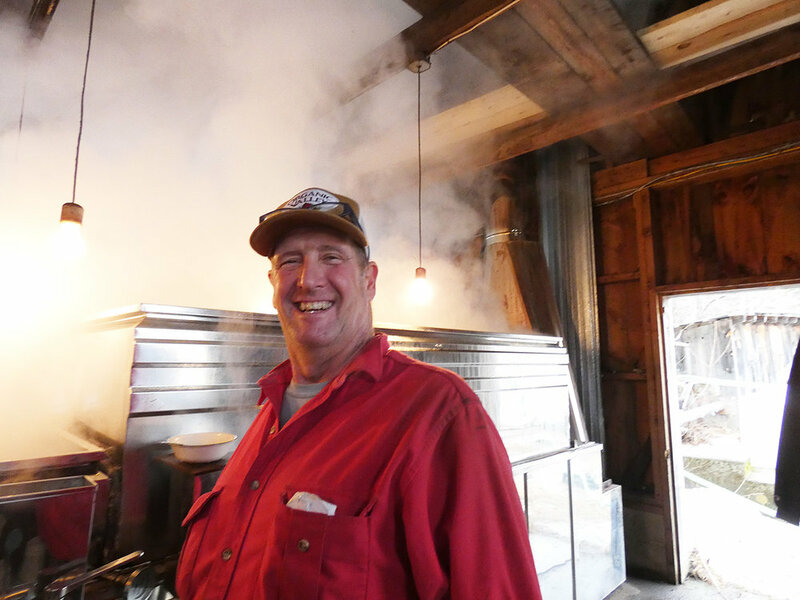 David boiled every day for 3 weeks, something he has never done in his 20 years of sugaring! A high volume of sap was collected. However, the sugar content was considerably lower than usual. At 2% sugar it takes 40 gallons of sap to make a gallon of maple syrup. One day David figured he boiled 70 gallons of sap to make a gallon of syrup! After that, he stopped doing the math. David, John, and Al Franklin Jr. boiled for the last time on Saturday March 31, 2018. A grand total of 383 gallons was produced. Our average crop is about 420 gallons. Thank you to everyone that helped us out. There is no way we could have done it all without you or had as much fun in the process. A weekend of tapping fun with Neil and Paul Franklin, Paul's girlfriend Ryan Thompson, college friends Mogley, Matt, Jane, and Nick. Al Franklin Jr., Greg Flickenger, Rob and Tyler Potter, Dana Franklin and his friend Dan, Sierra Gardner and Alex all helped with firing and filtering and splitting and stacking wood. And much gratitude to Mark and Kate Bowen and Rick Zamore for the invaluable piles of slabs and pine and hemlock logs that helped make it possible to boil all the sap that came in! Each sample represents a different day of boiling. Two more windows full of samples are not shown. David drawing off syrup. From here it is checked for correct density( brix sugar) and then filtered.